After a highly technical three-week trial in November, the 10-person jury unanimously found that the companies had willfully infringed on BU's patent for the invention by 2013 Innovator of the Year Theodore Moustakas, College of Engineering Distinguished Professor of Photonics and Optoelectronics Emeritus. Because the jury found the infringement to be willful, the $13,665,000 award could be doubled or tripled by Judge Patti B. Saris. No date has yet been announced for further proceedings. Despite the amount of damages awarded, "the best part of this is that it validates Professor Moustakas' work," says Michael Pratt (Questrom'12), interim managing director of BU's Technology Development office. "The story is really not about the money. The first thing we want is recognition of his seminal contribution to this field." Moustakas, who became a professor emeritus when he retired in June but continues to conduct research at the Photonics Center, testified extensively at the trial and was present in court every day. When the judge read the jury's verdict, "I put my head down," he says. "I cried." He describes the jury's decision as "amazing...everything we asked," saying also that his lifetime's work was being challenged. "Fundamental to our mission as a global research institution is nurturing an environment of discovery that supports our faculty and the incredibly important work they do," says Jean Morrison, provost and chief academic officer. "We are delighted with the verdict in this case. Boston University has successfully fought, and will continue to fight, for our faculty members and the intellectual property they create here." The three primary defendants, all Taiwan-based, were Epistar Corporation, Everlight Electronics Co., Ltd., and Lite-On Technology Corporation, along with various subsidiaries, most located in the United States. Each is involved in manufacturing or packaging LEDs for use in consumer electronics. A number of big-name electronics manufacturers were initially part of the University's case, but they avoided litigation by joining a settlement that includes licensing and confidentiality agreements. The University was represented by Michael Shore, a partner at Shore Chan DePumpo LLP, in Dallas, specialists in intellectual property cases, and Erik Belt, a partner specializing in patent disputes at the Boston law firm McCarter and English LLC, which has represented BU before. While it is possible for the defendants to appeal the verdict, Belt says it would be difficult to overturn the jury's clear finding of fact. The University will receive less than half of the final award, after the attorneys, who took the case on a contingency basis, and previous patent licensees are paid. Moustakas will receive 30 percent of the University's share. 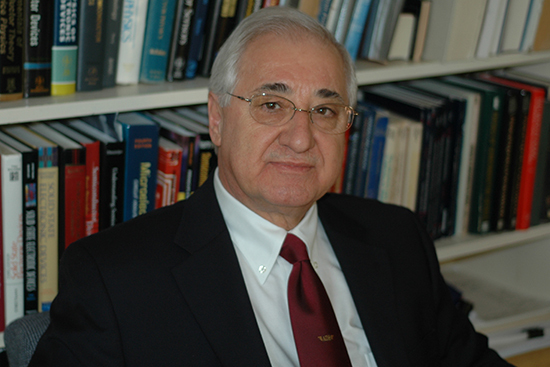 Moustakas joined BU in 1987 and was named the University's inaugural Distinguished Professor of Photonics and Optoelectronics in 2014. A search is under way for his successor, and the Distinguished Professorship will be renamed the Theodore Moustakas Professorship of Photonics and Optoelectronics. Moustakas' invention dates to June 22, 1990, when researchers in his lab were trying to produce microscopically thin layers of gallium nitride to be used in the LEDs, growing crystals of the substance at high temperatures. They discovered that a heater used in the experiment had malfunctioned and the material had cooled to 270 degrees Celsius, far below the intended 600 degrees. But instead of aborting the experiment, Moustakas told them to fix the heater and continue. The snafu led to the growth of a smoother, more translucent gallium nitride layer that also grew much faster when crystallized at the higher temperature, a result replicated-deliberately-the very next day. "The real story is the robustness of Moustakas' technology," says Pratt. "It really did become a personal story. There was an attack, an affront to his creation. They had two experts saying it didn't exist...and the jury wasn't buying that at all." "To infringe in patent law, you don't have to know about the patent and you don't have to have an intent," says Belt. To prove willfulness, "you basically have to show the other side knew of the patent and they were perhaps recklessly disregarding the fact that they were infringing or willfully blind to it. There's a lot of ways to say it, but you basically have to show that there was willful disregard for BU's patent rights. "I think this really validates Professor Moustakas' scientific breakthrough and establishes him as one of the great scientists in his field," Belt says.